With Amazon Prime's help, the company's international sales growth rose sharply last quarter. And U.S. growth wasn't bad either. What had been the slowest-growing of Amazon.com Inc.'s (AMZN - Get Report) three reporting segments just saw a major pickup in growth. And markets are quite pleased. Amazon reported Q3 revenue of $43.74 billion (up 34% annually) and GAAP EPS of $0.52, easily beating consensus analyst estimates of $41.58 billion and $0.07. The company also guided for revenue in seasonally big Q4 to be in a range of $56 billion to $60.5 billion (up 28% to 38%), above a $54.24 billion consensus. And for operating income -- held back by heavy spending growth -- to be in a range of $300 million to $1.65 billion versus a year-ago level of $1.3 billion. In response, shares rose 7.6% after hours on Thursday to $1,046, leaving them up 40% on the year and not too far removed from a high of $1,083. That high was reached shortly before Amazon sold off in July after posting mixed Q2 results. On Friday morning, Amazon shares were up 8% in pre-market trading. Worth noting: Both Q3 sales and Q4 guidance are getting a boost from the late-August closing of the Whole Foods acquisition, which still might not be factored into some analyst estimates. Q3 sales growth would've been 29% if not for the $1.3 billion that Whole Foods added to Amazon's top line. But that still represents an acceleration from the 25% growth Amazon posted in Q2. Contributing heavily to that acceleration: Amazon's International e-commerce reporting segment saw revenue rise 29% to $13.7 billion, a big improvement from Q2's 17% growth. With currency swings shifting from a headwind to a tailwind, the improvement isn't quite as pronounced on a constant-currency basis -- it's 28% versus 22% -- but is still significant. When asked about international growth on the earnings call, CFO Brian Olsavsky suggested it had much to do with the impact of Prime Day (held in July, saw a 60% global sales jump relative to 2016's Prime Day) being larger than expected -- both in boosting sales and driving Prime sign-ups. He also noted Amazon's momentum in India, where the company has been investing billions to grow its footprint, and the July closing of Amazon's purchase of Middle Eastern online marketplace Souk.com. Of course, what allowed Prime Day to have such a big overseas impact is that foreign customers are now also warming to Prime on a large scale, turning to it for their weekly and monthly shopping needs the way that so many American consumers have. Olsavsky, talking about Prime's international pull, noted Prime Video saw a giant international rollout in Q4 2016 and that continued investments in "adding selection, especially FBA selection, increasing free shipping offers and also [the] speed of shipping offers" are bearing fruit. North American growth wasn't shabby either: It was at 35% officially and around 28% after backing out Whole Foods' sales (all but 9 of Whole Foods' 473 stores are in North America), with revenue totaling $25.4 billion. That's an improvement from 27% growth in Q2, 24% in 21% and 22% in Q4 2016. A pretty impressive pattern for a business closing in on $100 billion in annual sales, and evidence of continued share gains driven by Prime and third-party seller growth. Amazon Web Services (AWS), meanwhile, matched the 42% annual revenue growth it saw in Q2, with sales reaching $4.58 billion. Though this trails the 90% growth Microsoft Corp. (MSFT - Get Report) reported for its Azure cloud platform, AWS from all signs remains far larger, especially in the market for cloud infrastructure (IaaS) services such as computing and storage. And the Q4 growth rate could get a boost from the passing of the 1-year anniversary of major 2016 price cuts. AWS also produced nearly all of Amazon's profits in Q3, thanks to a 36% increase in operating income to $1.17 billion. With Amazon continuing to make giant warehouse, logistics and content investments, the North American segment's op. income fell to $112 million from $255 million, and the International segment's op. loss grew to $936 million from $541 million. Thanks to such investments, along with the addition of Whole Foods, Amazon's GAAP costs and expenses rose 35% to $43.4 billion, with large increases recorded in fulfillment, marketing and tech/content spend. Headcount totaled 541,900 at quarter's end -- up 77% annually and 47% excluding the Whole Foods and Souk deals. And with Amazon also spending $2.7 billion on capital investments (up 44%) and $2.3 billion on property and equipment bought under capital leases (AWS-driven, up 65%) free cash flow for the trailing 12 months (minus lease repayments and assets acquired under capital leases) swung from positive $3.8 billion a year ago to negative $1 billion at the end of Q3. 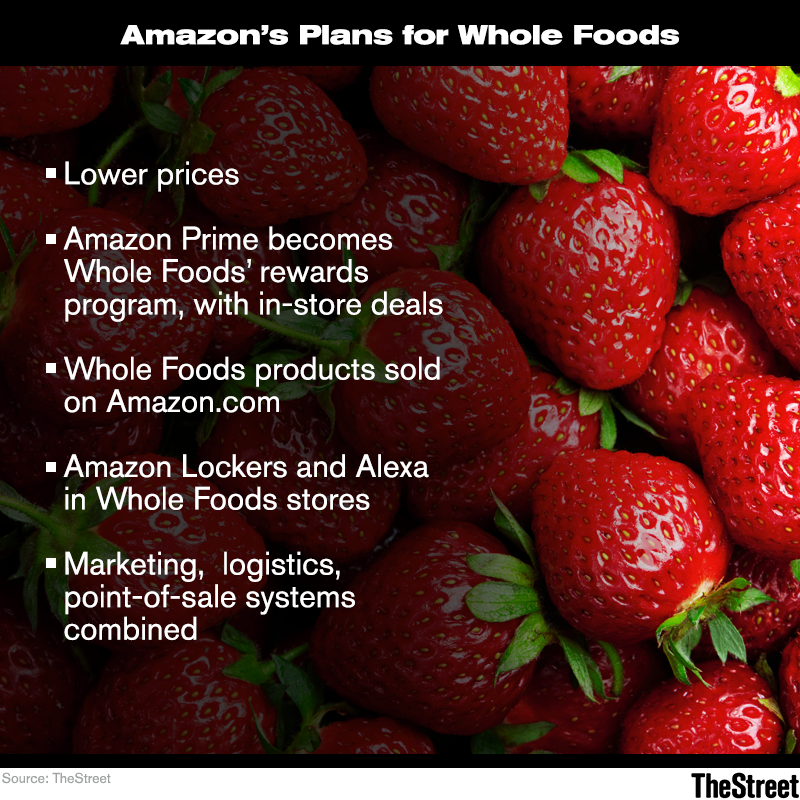 Moreover, while Olsavsky tried not to divulge too many details, his earnings call remarks did suggest Amazon plans to eventually make big Whole Foods-related investments. Among other things, he indicated Amazon is working on plans for additional Whole Foods store launches and predicted there will be "more cooperation" in time between the grocery chain and Amazon's Prime Now rapid-shipping service and AmazonFresh grocery delivery service. Likewise, Olsavsky forecast Amazon, which has seen some original content projects fall flat and recently saw Amazon Studios chief Roy Price resign amid sexual harassment allegations, will once more up its video content spend next year. "[Video] continues to drive better conversion of free [Prime] trials, higher membership renewal rates for existing subscribers and higher overall engagement," said Olsavsky. "We also know Prime members who watch videos also spend more on Amazon." Markets clearly don't seem to mind any of this spending. Not when Amazon has managed time and time again to deliver payoffs -- in terms of new customers, higher spending among existing customers and greater customer loyalty -- for its manic investment pace. And not when the continued shift in its revenue mix towards higher-margin service revenue streams is still driving margin gains. Gross margin rose to 37% in Q3 from 35% a year earlier. AWS' growth played a role. As did the fact that in constant currency, Amazon saw 40% increase in third-party seller services revenue to $7.9 billion, a 59% increase in subscription services revenue (driven by Prime) to $2.4 billion and a 58% increase in "Other" revenue (driven by Amazon's ad business) to $1.12 billion. Until markets find good reason to doubt either Amazon's revenue growth or margin expansion stories, or unless macro events knock the wind out of its sails, the odds of investors falling out of love with Jeff Bezos' company seem pretty low. Especially when there's growing evidence that the e-commerce playbook Amazon perfected in the U.S. is starting to yield larger dividends elsewhere. TheStreet's Eric Jhonsa previously covered Amazon's earnings report and call through a live blog.